Dale G. Vest wrote over 120 releases by many artists including country legends Merle Haggard, Albert Brumley Jr., Jimmy Payne, and Doug Kershaw. He was the recipient of over 40 music industry awards, including two from the Society of European Songwriters, Authors, and Composers (SESAC). 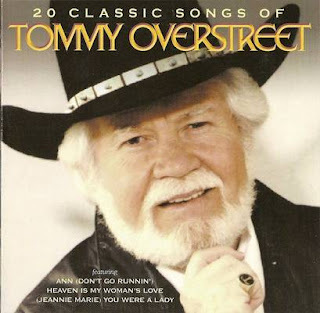 Of all his musical achievements, though, he was most proud of his many recordings by Country & Western legend Tommy Overstreet. Tommy Overstreet is a national and internationally recognized Country Music recording artist, songwriter, record producer, and music publisher. His experience spans over forty years as a working professional with 7 Number 1 Hits and 26 Top Ten Singles. Listed below are some of his other accomplishments. After entertaining adults for generations, how did it happen that you and Dale G. Vest co-wrote a children's book? "When I first met Dale Vest , he had a little boy named Marty and I had a son named Tommy, III. This story was based on Marty, a freckled-face, red-headed boy with a calick in his hair. 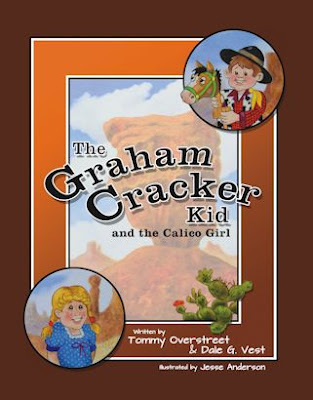 I give complete credit to Dale for coming up with The Graham Cracker Kid and the Calico Girl. We put our heads together after the rough draft and we tweaked it and I changed some verses and rhymes. But the story is based on true events in our lives." What advice do you have for children aspiring to become singers /songwriters? "I wish there was a book that young people could read to get a handle on how to get into the music or recording music. However, Billboard Magazine wrote a rather thick book with heavy reading, called This Business of Music which encompasses all that you need to know about the music industry and has songwriter's forms and gives a working knowledge of the music industry. "My advice to young aspiring singers and songwriters is that you need to make some sort of effort to learn sales. Basically, you are selling yourself and you need to know how to do that. Take a course in sales. I was a salesman before I became a singer full-time and my dad was a salesman. Another piece of advice is that you have to get out of bed and feel good and smile and be friendly, whether you feel that way or not. Rehearse and learn your craft, articulate, pronunciate correctly, and learn how to phrase a song. Phrasing a song is a necessary art to songwriting." How important is offering music in the schools? "I was raised at a time when we had music in elementary, junior high and high school. In junior high, we had music classes, metal shop and wood shop; senior high same thing. It taught kids certain things that they normally wouldn't learn at home. In the 20s, 30s, 40s, and 50s, 8 out of 10 homes in this country had pianos. Hardly anybody has pianos anymore. Schools have gone away from music. We need to get back to the basic teachings of art, music, and literature. Kids need to learn English, reading, writing and arithmetic but music is so important to offer in schools especially for those children who aren't exposed at home. "Louis Satchmo Armstrong, famous trumpeter and singer, said that music is the best diplomat in the world. It tears down all the inhibitions of people. It bridges the gaps, welcomes, and connects people from all around the world." I am thrilled that Carolyn Wilhelm, author of The Wise Owl Factory, has put together packets of free printables and even a game to coincide with this wonderful book. To see her book review and wonderful printables, just click here. Would you like a glimpse into Kindergarten? Do you need inexpensive ideas, activities, and games to teach your child through play? Mommy with Selective Memory and I can help save your sanity, one project at a time, with The Happy Mommy Handbook: The Ultimate How-to Guide on Keeping Your Toddlers and Preschoolers Busy, Out of Trouble and Motivated to Learn. Both are bestsellers and are also available from Barnes & Noble and Kobo. Thanks for linking up!!! LOVE this post!! Tammy - I am very happy to find your blog - and to link up. I LOVE books! Lora - Thanks so much for sharing this on G+. I love your blog - amazing. I could pin from it all day. Have a great day. What great fun! This looks wonderful! It is a wonderful story and a work of art - in poetry and illustrations. Thank you for visiting - love your blog. Diane - Thank you so much for visiting and commenting. I echo Tommy's thoughts around the lack of music training in schools. I lament the loss of the music programs as part of the curriculum myself. I think learning music develops specific parts of your brain and with the focus on more academic subjects, I think these areas are largely becoming under-developed; unless of course families take the initiatives to make music training an extra-curricular activity. Thank you Renee. The schools really need to offer music - too many children won't be exposed to great music otherwise - and you are right. Music does help brain development in many areas. What fun! Reading and music are both such creative outlets that it follows that someone fantastic at one would excel at the other. Max might have danced once or twice to Tommy's music ;) Thanks so much for linking into the Kid Lit Blog Hop! It's a great blog hop! I admit, I don't know much about country music, but this looks like fun. Thanks for linking up to The Children's Bookshelf. Even if you don't listen to country music - this book is a treasure. It is written by one who understands poetry and music. Thanks for visiting. Great post! I like that Tommy encouraged aspiring singer/songwriters to take a sales course. The Graham Cracker Kid looks like a fun read. This book is a fun read. There a bit of everything: adorable characters, rhyming, suspense. Thanks for sharing this post both on TCB and in the Great Books for Kids community. It sounds like a fascinating book. I love the point that he makes about how we are neglecting some aspects such as music that used to be considered important for the children's education! Yes, music really needs to continue to be offered in the schools. Thanks for visiting. Love your blog. Music education in schools is SO important! Thank you for sharing this great post with the Kid Lit Blog Hop! Katie - Thank you for visiting my blog and for the hop! Love the Kid Lit Hops! This is such a nice interview and explanation of how this story began. Thank you so much!